Good afternoon, chickadees! 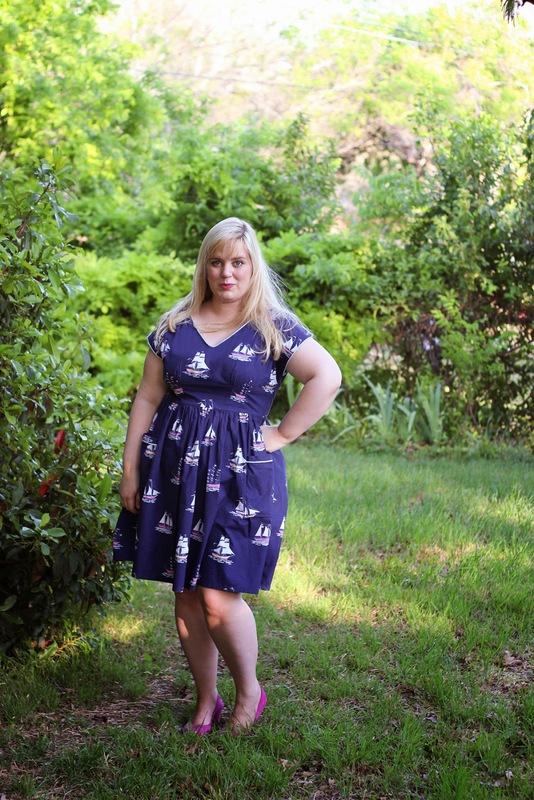 Today is my second stop on the Curvy Colette Blog Tour, which means it's time to unveil my Moneta dress. Or, anyhow, one of my Monetas. This pattern is so wonderful that I've already cut out another two dresses. That's always a good sign, right? 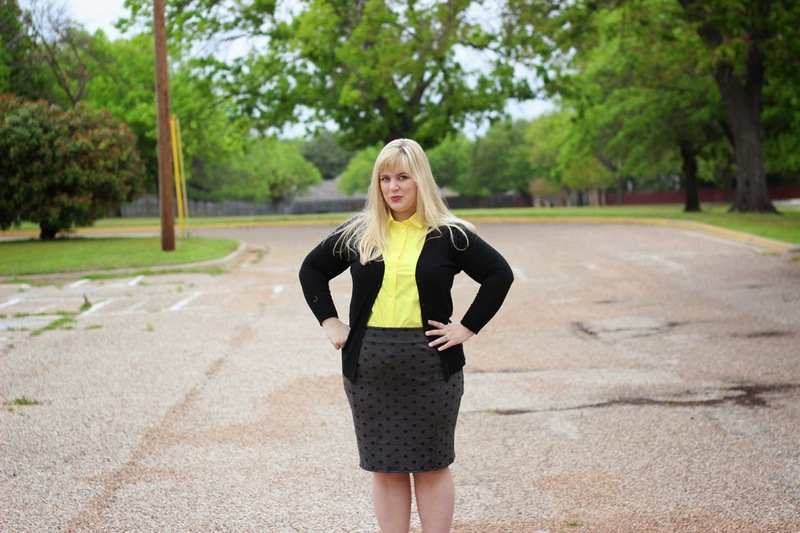 Like the Mabel, the Moneta is one of Colette's new patterns for knits. It's a simple fit-and-flare dress, with three sleeve variations, an optional collar, and an additional five collar variations available for download. 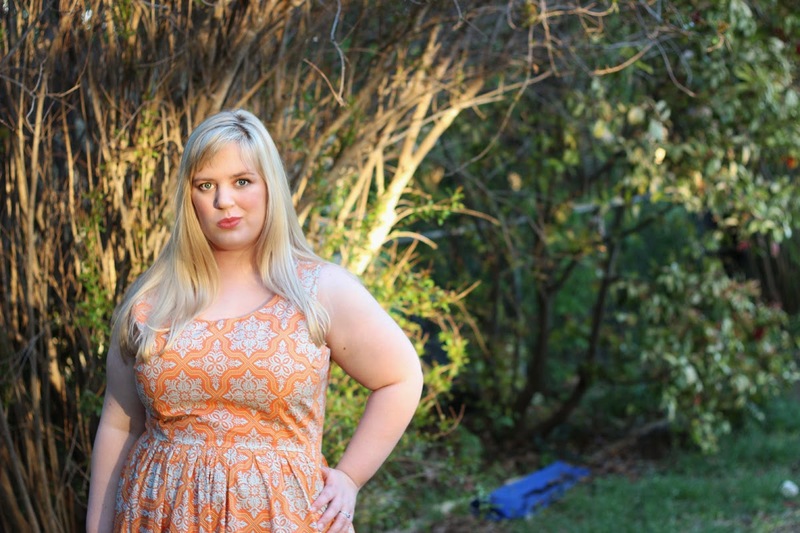 It is, essentially, the most versatile dress in the world! 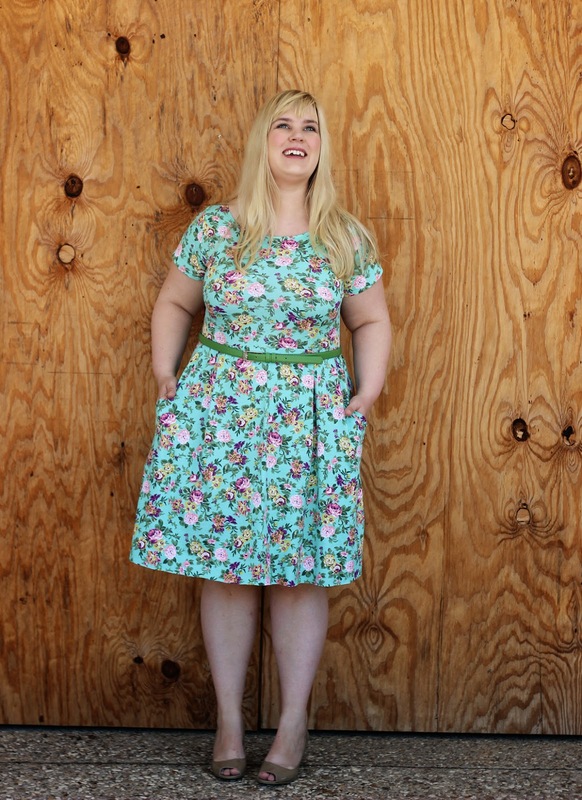 The Moneta can be made to fit any style and, with the addition of more plus sizes, almost any body. 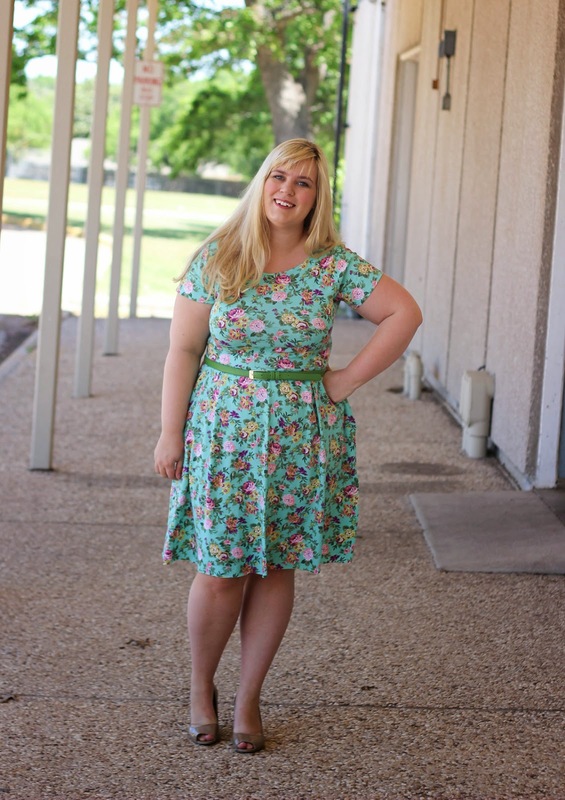 For my first Moneta, I opted for a springy, floral aesthetic. Shocking, I know. This fabulous cotton jersey is from Girl Charlee, bought on the heels of my serger earlier this year. It's a pastel floral, with pinks, purples, and yellows set against a spearmint background. It is such a Mary fabric! Even better, it was so easy to sew up. Despite its tendency to roll, this jersey pressed beautifully and has just the right amount of stretch for the Moneta. I'm not sure how the rest of GC's jerseys are, when it comes to quality, but this one was lovely. As for the pattern, it's a total success. Would we expect anything less from Colette Patterns? I chose the short-sleeved version, ever cognizant of the impending doom summer, and it was a very straight-forward project. Since it's unlined, the sleeves and neckline were simply turned under once, then hemmed. Knits are so great, in regards to finishing techniques. There are no facings or bindings to mess with, just simple stitching! I did make one small adjustment to the pattern, however. Instead of the shirring called for on the skirt, I opted to softly pleat this first version. It's somewhat unconventional, but I adore the look of pleated knit fabric. It and flows and flatters beautifully. Apart from that little change, everything else is as-directed. I serged the seams, twin-stiched the hems, and stabilized the shoulders and waistline with clear elastic. Cut-to-hem, it took me about four hours. A good hour of that was spent cutting out, of course, because that's the one area where knits can be fiddly. With a little patience and lots of pattern weights, the whole process isn't too painful, however! This was such a simple dress, y'all! Even better, I really love the resulting silhouette. My mind is fairly bursting with ideas for more Monetas. While I love a complicated pattern as much as the next sewist, there's something wonderful about a simple, easily embellished basic dress. 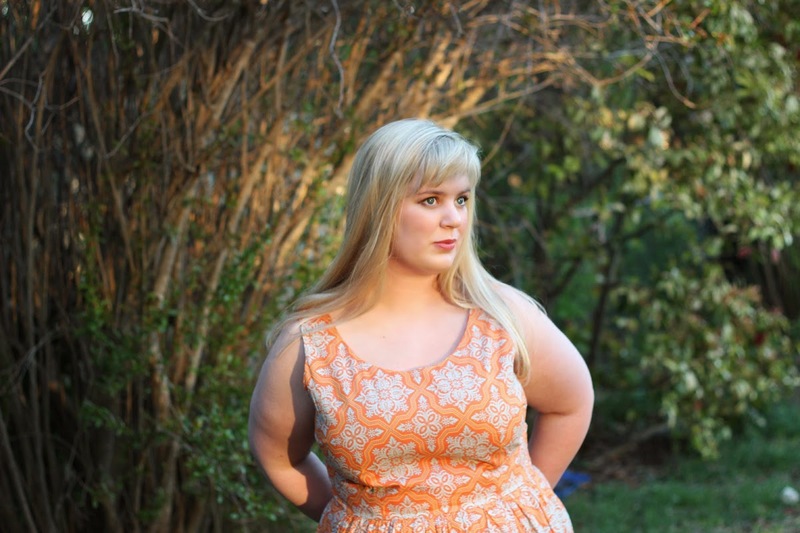 There is no limit to what a girl could make with a little vision and the Moneta! Personally, my next one will be nautical in aesthetic. All those collars demand to be tried. The fabric! Not only is it gorgeous, but it's so comfortable. Huzzah for pajama dresses! The shape! 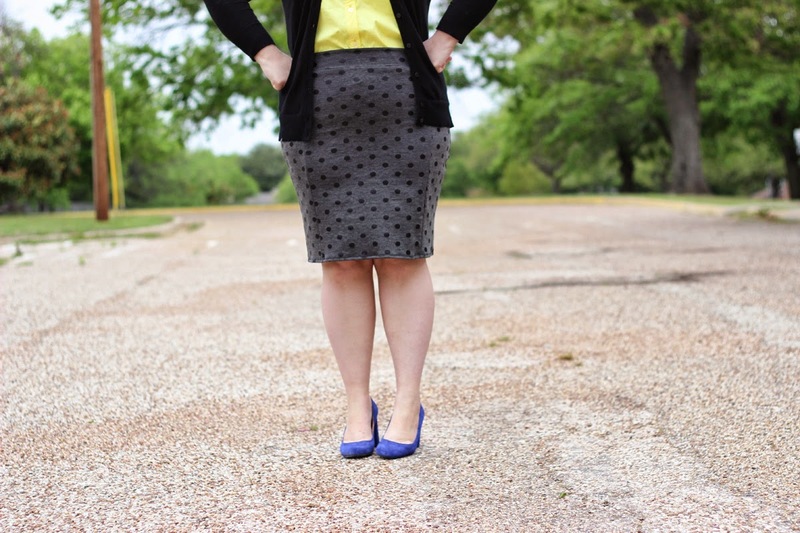 The Moneta really is such a classic silhouette. This dress is made to flatter all figures. The sizing! 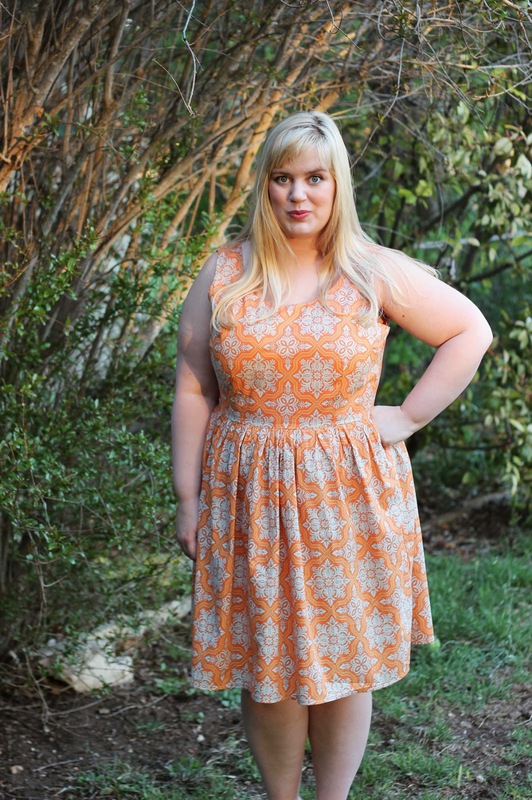 I made a straight XL, which fit me to a T, but I'm so excited about this expanded size range. 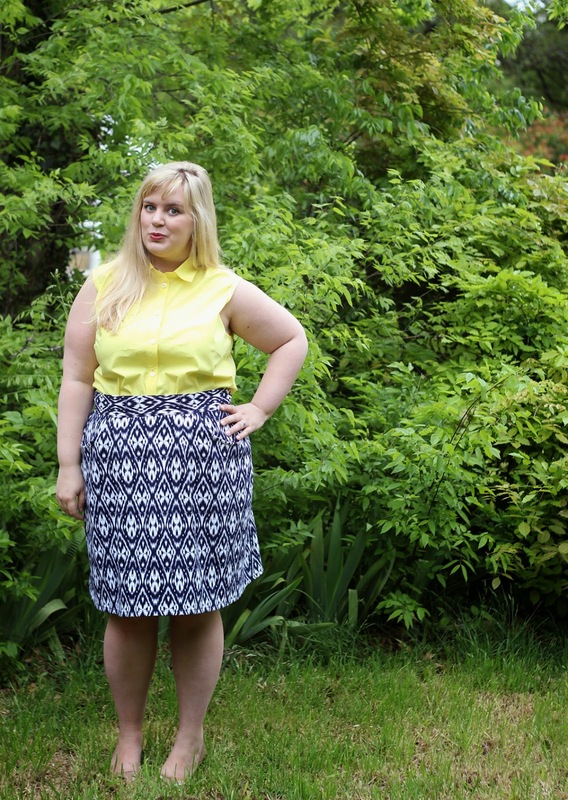 You can make a Moneta, whether you're an XS or a 3X. Way to go, Colette! Pleated the skirt, instead of gathering. I am dying to add a collar to this beauty! It would have been a bit too twee with this fabric, but will definitely make an appearance soon. 2 yards of clear elastic. "I would like to thank my parents for never giving me a ride to school, the LA city bus driver who took a chance on an unknown kid, and last but not least, the wonderful crew from McDonalds who spend hours making those egg McMuffins without which I might never be tardy." Hello, moppets! 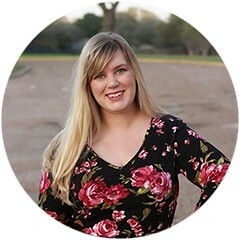 You may notice a change in my blog post nomenclature today--there's no Miss, unless of course you count the lovely Miss Roisin. Happy Sew Dolly Clackett Day! As a way of celebrating Roisin's impending nuptials to her wonderful Nic, the sewing community has spent the last two months emulating her fun style. It's no secret that I'm a big fan of Roisin's. Not only does she use prints better than anyone, but Our Lady Clackett has the cutest shoes around. 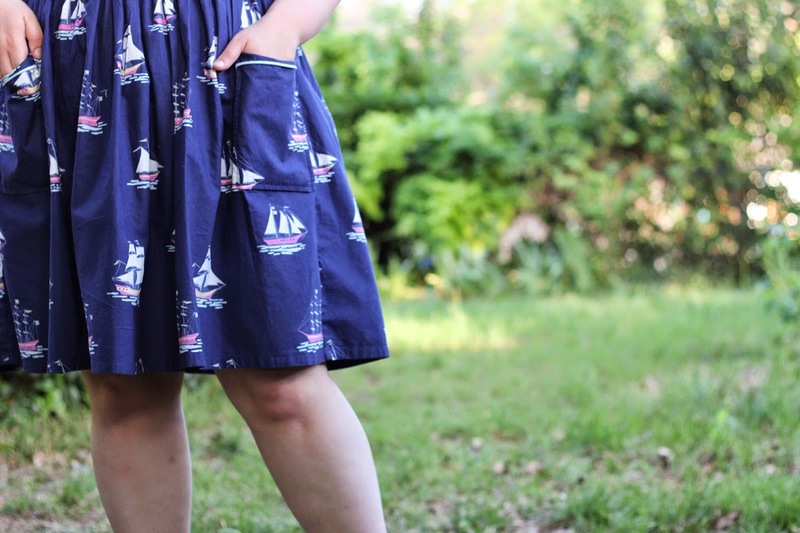 For my homage to the lovely Roisin, I grabbed my favorite pink pumps and the Out to Sea print from Sarah Jane, then made--of course!--a modified Anna dress. 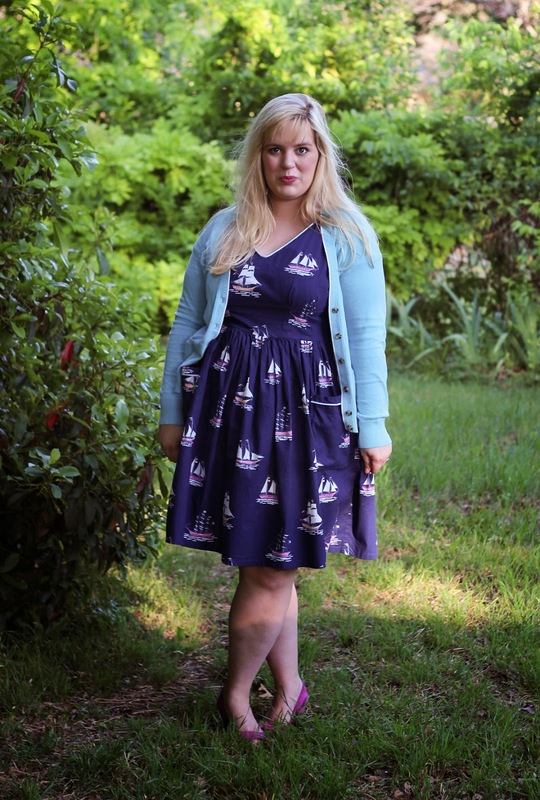 I have made the Anna dress quite a few times before, but this one is special. Not only did I add a wide, gathered skirt to the v-neck bodice, but I also embellished the Sam Hill out of it. There is light blue piping on the neckline, the armholes, and the patch pockets. THAT'S RIGHT, THE PATCH POCKETS. I added, then piped, patch pockets. I'll let that bit of awesome sink in. Are your palpitations of amazement easing a bit? As the Queen of Quick Dresses, I may be just a bit too proud of myself for this feat, but whatever. I sewed perfect squares and basted them on three times, to find the perfect placement. There is effort and care here, y'all. My vow to embellish more things is still going strong! Wonders never cease. As with my last Anna, this one had my standard fitting alterations. The bodice was extended an inch, had a 1.5'' FBA, and a small-waist adjustment. Thanks to the blousy drape of this fabric, the waist is still a little big, which I'll probably fix at some point. Loose dresses are great for summer, but waists that shift about drive my crazy! Let's talk about this fabric, though, shall we? Sailing across the navy blue expanse of cotton are dozens of schooners and sloops. In the colorway I chose, these boats are illustrated in light blue, hot pink, and sunny yellow. This fabric is really high quality for a quilting cotton, with a drape and weight similar to a nice poplin. It's super comfortable against the skin and holds the skirt shape beautifully! No wonder Roisin uses Michael Miller prints so often, if this is the sort of fabric they come in. It's certainly not the stiff quilting cotton of JoAnn's! The Fabric! This is such a fun print to wear. The shape! The Anna bodice paired with a gathered skirt remains one of my favorite silhouettes. In the end, this is such a fun, wearable dress. 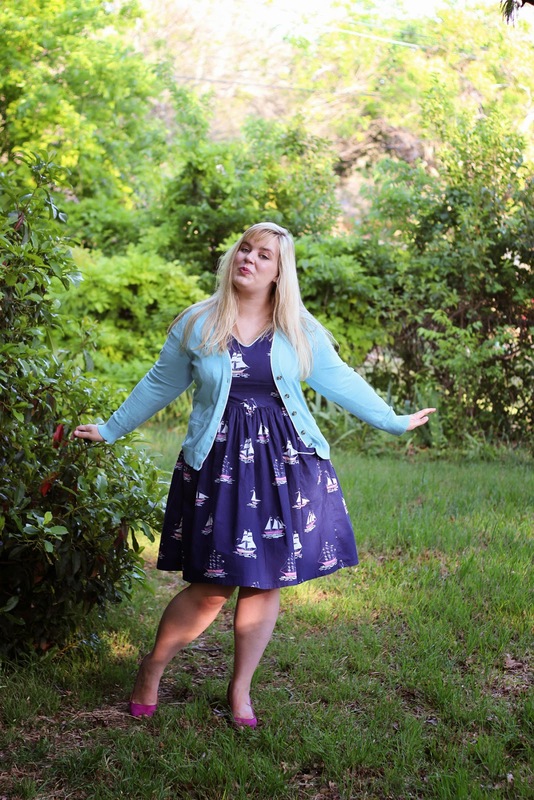 Even better, it's a tribute to one of the coolest sewing bloggers out there! Sending you good wishes, Roisin and Nic! Note: The quote in the title not only references the late nature of my entry, compared to the challenge's time frame, but it's also from one of the only movies I can actively quote. "You see how picky I am about my shoes and they only go on my feet!" This photo is ridiculous, but I had to include it, because it is also hilarious. Apparently, this dress makes me want to swish! Good morning, friends! 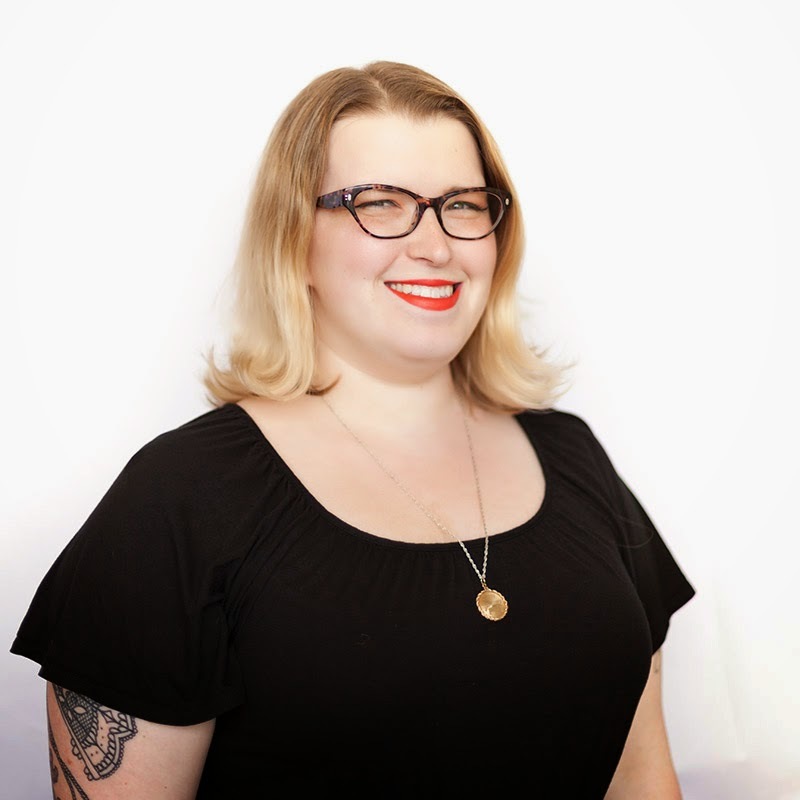 As promised, today's stop on the Curvy Colette Blog Tour is focused on the brains behind these lovely patterns: Alyson Clair and Sarai Mitnick. The Mabel and the Moneta are not only Colette's first patterns for knit fabrics, but also their first with an expanded size range. We thought it would be fun to peek inside the creative process behind these new offerings, so Alyson and Sarai graciously agreed to answer some questions for us. Thanks, ladies! Today on Idle Fancy, I'm chatting with knitwear goddess, Alyson Clair, while Jenny is hosting the lovely Sarai Mitnick over at Cashmerette. 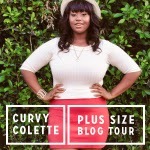 Check out both interviews and let us know how you're enjoying the Curvy Colette Blog Tour! Mary: Good morning, Alyson! We're so excited about these two designs and fascinated by the creative process behind them. What were your main sources of inspiration for these patterns? Alyson: My main sources of inspiration are always classics that can live in your wardrobe for a long time, and also be very versatile. When I'm designing a pattern I try to think of all of the different bodies that may wear it, and how to make it flattering on a variety of them. I'm also a fan of fancy, and comfort. There is no reason you can't have both. Mary: We're so excited about the inclusive size range of these patterns! Could you describe a bit of what is involved, when fitting an expansive size range? Alyson: When doing a size range of this scale, it is best to have 2 bases. This is important, as body proportions can change a lot from one end of the range to the other. We fit on a size Medium and a size 2XL live models, and also Colette Patterns now has dress forms of both of those sizes. . So it's double the work from a regular pattern or style, but it is so important to do it right! I'm a super big patternmaking nerd, so it was an exciting challenge to work on this. I'm very happy with how the patterns turned out, and I really think people will enjoy them. Mary: Your own clothing line, Clair Vintage, is known for chic knitwear. How did you begin designing with knits? Alyson: I actually did not sew until I got to college. I cursed my way through sewing with wovens in classes. As soon as I learned to sew on a serger with knits, it was magical. I find knits are easier to sew, much more forgiving, and easier to fit. I also looked at what was in my closet. 95% of my wardrobe is knit, and knits are what I am most comfortable wearing. So it was natural as I started making clothes to sell, it was with knits. There is so much fabric variety, it never gets boring. I also really enjoy patternmaking with knits, and love things with spandex. Mary: It must be a very different process, designing for home sewists versus designing for your own line! What were your favorite parts of this project? Alyson: Yes it is very different, but it has been really fun! Sometimes I feel like I speak a different language with commercial sewing vs. home sewing, since I spent 4 years working a factory. So I've learned a lot of things in this process, and love it. My favorite thing is all of the variety and options that can be done with the patterns. Working on a clothing line, you make many of a style and have to be concerned with sewing time, fabric costs, and embellishments. Home sewists can do whatever they like. I am so excited to see all of the variations and creativity that will come out of these patterns. Mary: So many sewists are still afraid to try out knit fabrics. What are the biggest advantages of sewing with knits? Alyson: If I can sew with knits, so can you! It's just different from wovens, from the way the fabric behaves, and how it is handled when sewn. Have patience, practice, and hopefully fall in love with sewing with knits. There are many advantages to sewing with knits. My favorite one is comfort. My body fluctuates in size a bit, and I like to know I can have 15lb up or down, and still be ok fitting into the majority of my clothing. Knits allow you to move freely, stretch with your body, and be comfortable. Also, a good majority of the time, the sewing time is not as long. Thank you so much for chatting with us, Alyson! You make knit fabrics sound like such fun to work with! I had a blast sewing up both of these patterns and can't wait for more knitwear options from you and Sarai. Readers, I'm curious, how many out there are newbies to knits? Are you excited to give these wonder fabrics a whirl, now that they've been demystified? 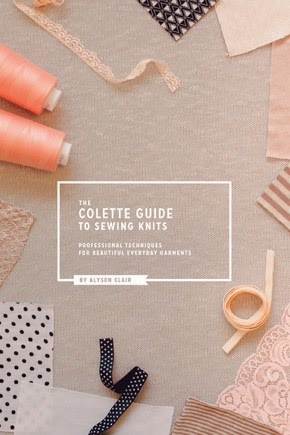 If you are interested in trying out knits for the first time, Alyson's new e-book, The Colette Guide to Sewing Knits, is now available. There's no better expert to have at your side, while you sew up the Moneta and Mabel. 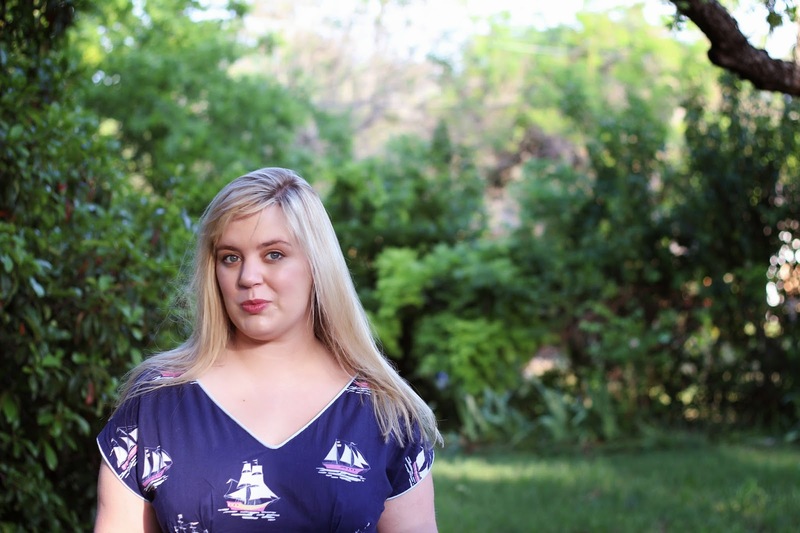 Also, don't forget to pop over to Cashmerette and check out Jenny's interview with Sarai! Good evening, darling ones! Today has been quite the exciting day at Chez Fancy. For the last twenty-four hours, the internet has rejoiced over the new knit pattern offerings from Colette Patterns, the Moneta and the Mabel. The Moneta is an elegant dress with three sleeve variations and five--that's right, five!--collar options, while Mabel is the perfect, simple pencil skirt. Not only are they two absolutely gorgeous designs, but they are being offered in an expanded size range. Both patterns are available up to a size 3x! When the lovely Jenny and I heard about these patterns last month, we were over the moon. 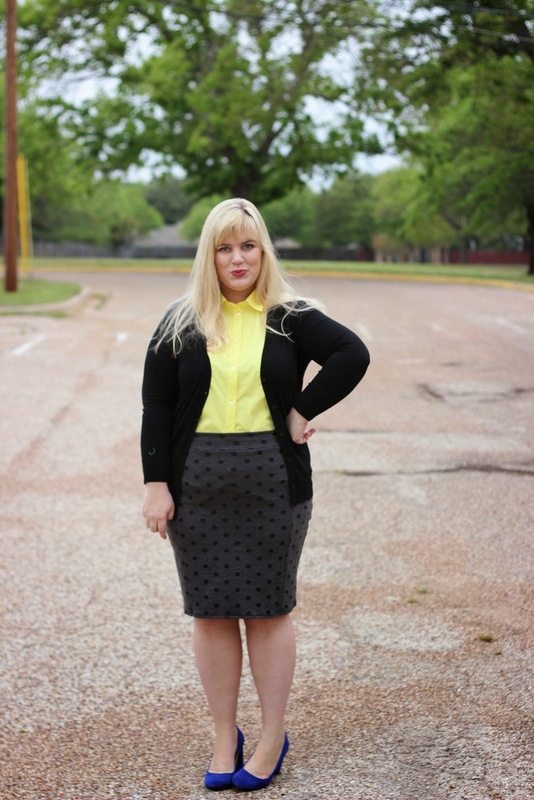 Gorgeous patterns for women of every size? We needed to celebrate! 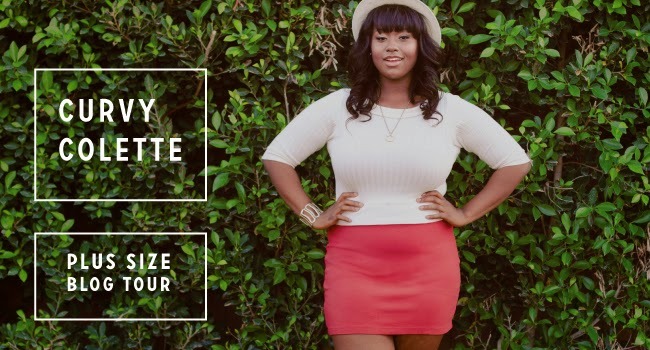 Thus, the Curvy Colette Blog Tour was born. 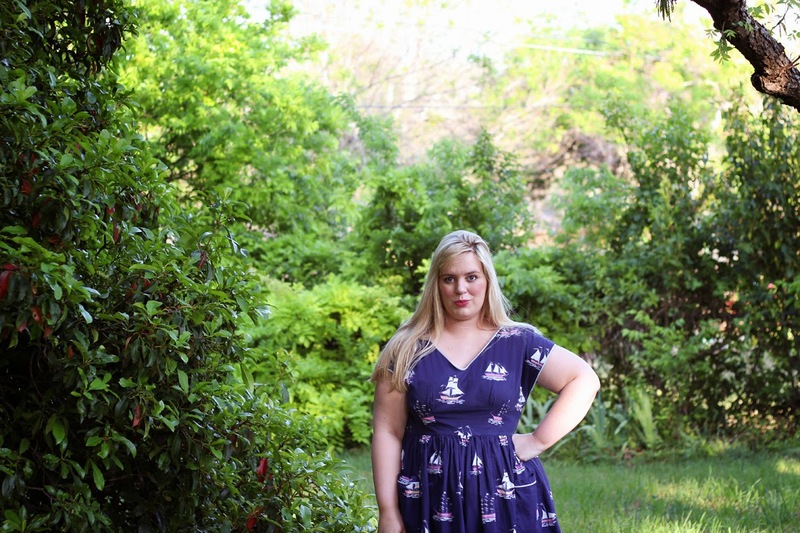 After joining forces with Sarai, we contacted some of our favorite curvy sewists and asked them to sew up their own stylish versions of the Moneta and Mabel. Over the next two weeks, we'll be hopping from blog to blog, sharing pretty knitwear pieces and celebrating curvy fashion. Jenny kicked off the tour today, with her smashing striped Moneta, and there are so many great outfits to come! The full line-up is below, so gear up for a fortnight of loveliness! 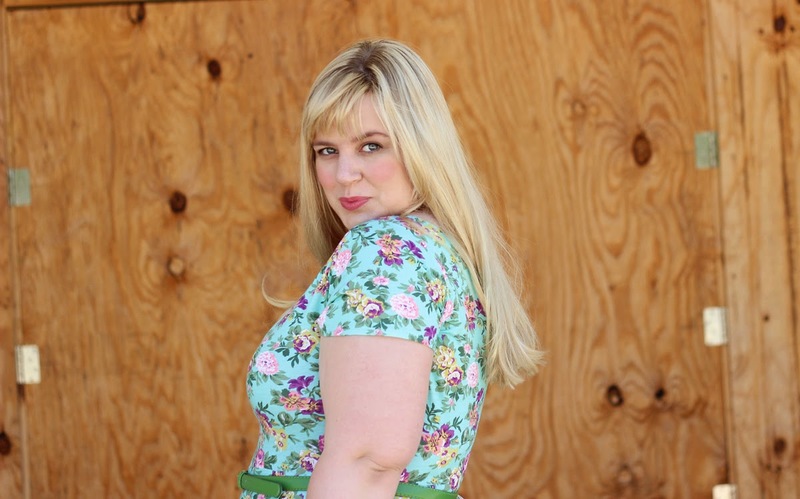 If you want to keep up with all the Curvy news, follow our blogs and social media! We'll be linking to all the pretty pieces, throughout the next two weeks. 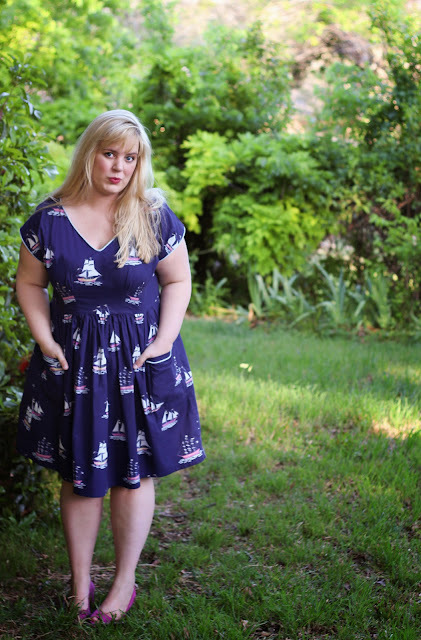 This is the first adventure of what we've dubbed the Curvy Sewing Collective, but not the last. 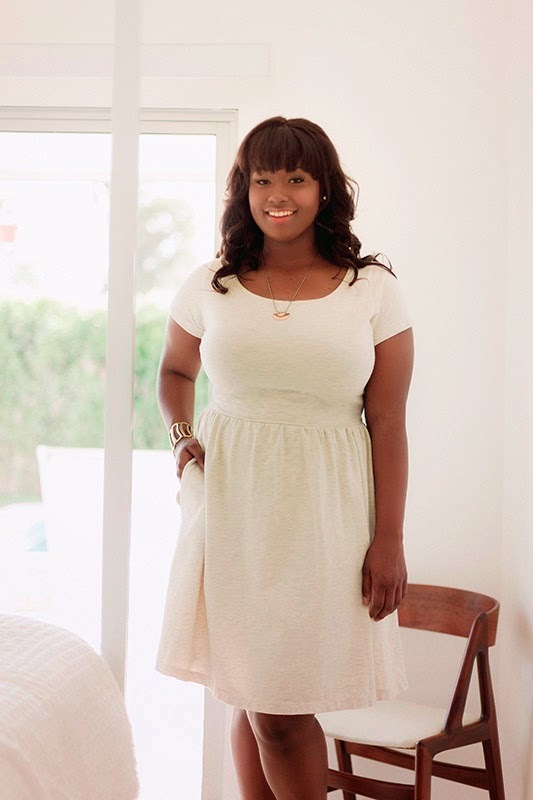 We're dedicated to making home sewing more accessible for plus-sized and curvy women. 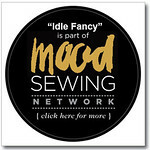 There will be sew-alongs, tutorials, and all sorts of inspiration coming your way over the next few months! Lastly, a huge thanks to Sarai and Alyson for their generosity in this venture. 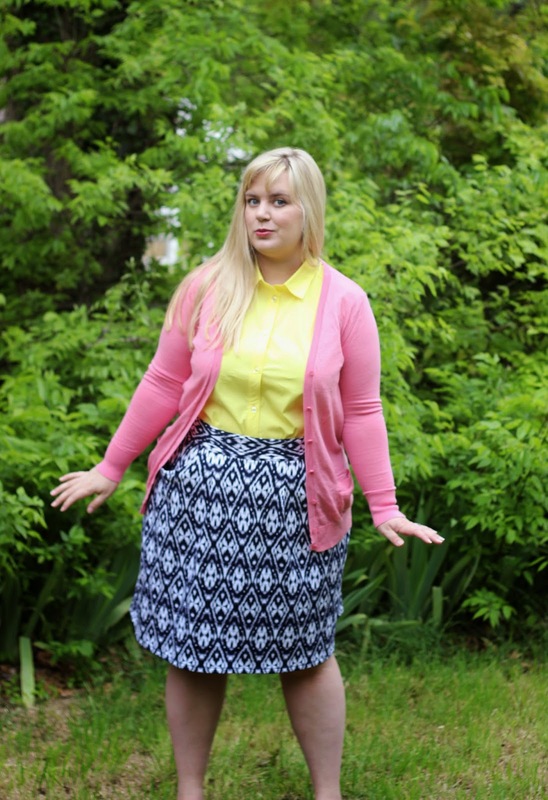 We're so thrilled to help showcase these patterns and encourage other curvy sewists to sew with knits! Good afternoon, kittens! Today marks the official beginning of spring. It's not the beautifully sunny days or the blooming flowers that usher it in, but something much, much nerdier. The Masters. This weekend, Sam and I are headed down to Austin, in order to indulge in a time-honored Danielson past-time: watching too much television, while eating BBQ and cheering for a tiny white ball. Obviously, that kind of thinking was quickly banished. I've decided, much like Erin, that the key to enjoying this process is staying true to myself. This competition is such a wonderful opportunity, not only for exposure to the sewing world at large, but to challenge my skills. There are a few difficult projects I've had kicking around in my head for eons, but labeled as "someday" things. For Project Sewn, I'm tackling these head-on—using the competition as an excuse to make my dream garments! If I get voted out early, which is a distinct possibility, I'll still have checked off some sewing goals. It's going to be so much fun, no matter what! With such a full sewing schedule, however, it means leaving a few other projects by the wayside. I had originally planned to spend the spring making a half-dozen easy, comfortable sundresses in preparation for summer. Instead, I'll be working exclusively on prior commitments and Project Sewn pieces. Except, of course, for this dress. Meet Artemis, my platonic sundress: a simple gathered skirt paired with my standard base bodice. In Texas, we spend most of the year bracing ourselves for summer. When you're sewing with thoughts of imminent 100-degree days, certain parameters come into focus. Cool, breathable fibers are a must, while form-fitting silhouettes should be used sparingly. The best summer dresses are sleeveless, swishy, and made from the lightest possible cottons. 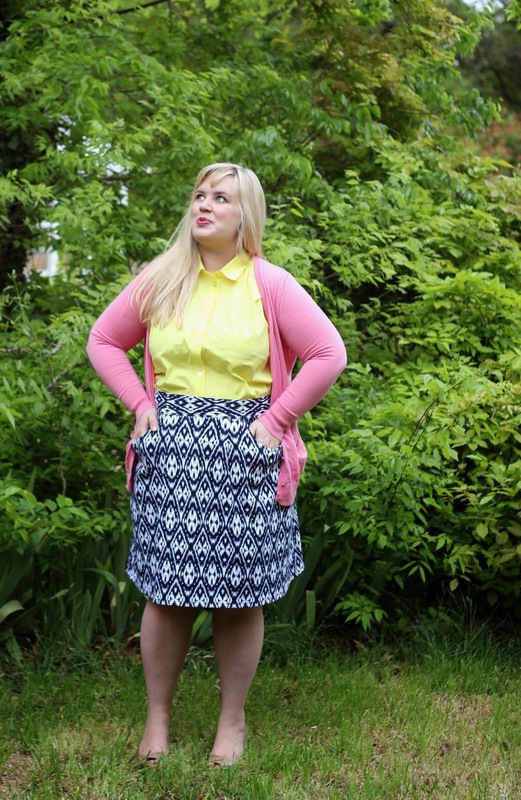 If you want to dress it up, grab a cardigan or blazer for the indoors. 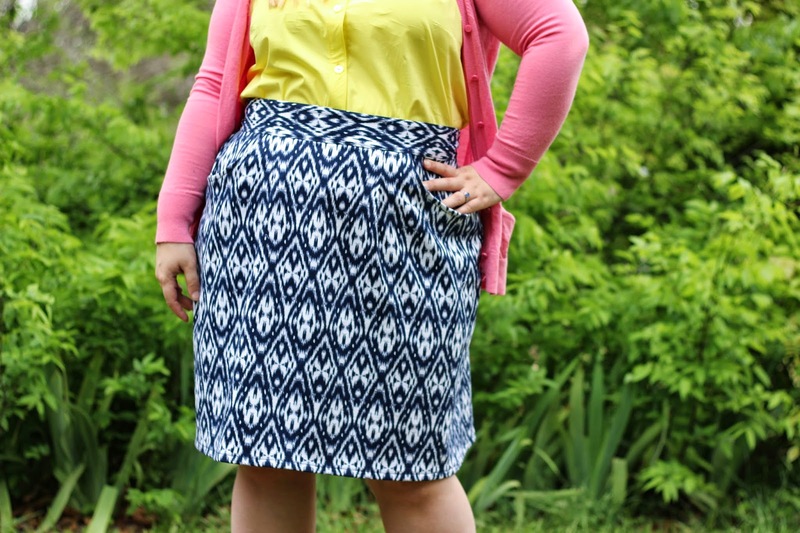 Layers are a southern sewist's best friend! Those guidelines gave me the Artemis. I used my bodice sloper to create a simple scoop-necked dress, adorned with a wide, gathered skirt. So easy! It's six darts and miles of gathering, finished off with a lapped zipper in the back. 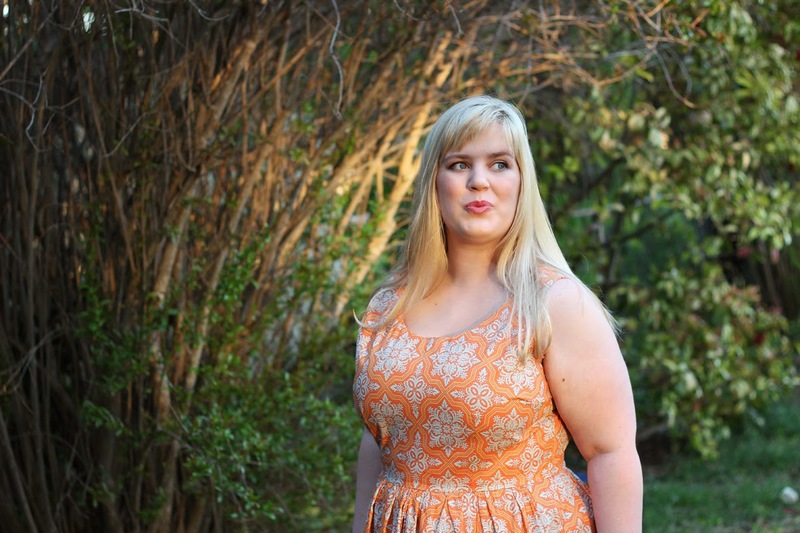 Only the bodice is lined, as fully lined dresses can be oppressively hot in August, in a coordinating orange cotton lawn. The fabric is a light, floaty cotton voile from Joel Dewberry's Heirloom collection. It's been in my stash for years, along with its purple colorway cousin, waiting for the right project. The print reminded me of Moorish painted tiles, like ones scattered through Spanish architecture, so buying it was a must. First it was going to be a Colette Jasmine blouse, then a layered skirt, but—let's be honest—it had sundress written all over it! The pairing of tangerine and sky blue makes me want to stroll through an open-air farmer's market or sip sangria on a (well air-conditioned) patio. Pattern-matching was kind of a battle, but it turned out reasonably well. There are little spots that aren't quite perfect—the side seams, oh heavenly seam ripper, the side seams—but nothing is too distracting. All-in-all, this dress is just what I wanted: a simple, pretty project before the days of epic sewing begin. There was minimal fuss and a totally delightful result! I'm especially looking forward to wearing this beauty, once my standard summer glow returns. That orange is going to be killer! The ease! This is a three-hour dress, tops. Is there anything better? The fabric! Soooo light and airy. The bodice! Slopers are such a great bodice base. This one was made a little roomier, with those sweltering summer days in mind, which makes it super comfortable. Nothing! Ah, the beauty of self-drafting. Come June, my next month of open sewing, I'm going to make a pleated version of this dress. Bring on the novelty prints! When gathering wide expanses of fabric, try three rows of basting, instead of two! It allows for more even gathers and control. 1.5 yards - orange cotton lawn lining.